Glaucoma is a condition that causes damage to the optic nerve, and can result in loss of vision. Various different factors affect whether or not you will develop glaucoma, or are at a higher risk for it. Some of these risk factors include family history of glaucoma, race, how high the pressure inside your eye is, how thin your cornea is, and the appearance of your optic nerve. If you have risk factors for glaucoma, we will run baseline glaucoma testing, which includes checking your pressure, assessing your optic nerve, a visual field to measure your peripheral vision, a special scan of the retinal nerve fiber that is damaged by glaucoma, and an assessment of the drainage part of your eye. It is important to do these tests annually to monitor for any changes or worsening. 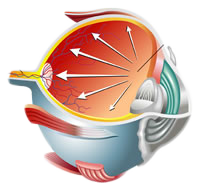 The exact cause of glaucoma is not fully known, but has some relation to the pressure inside your eye. Reducing the pressure inside your eye is the only treatment available for glaucoma. This can be done in several ways. The initial treatment is to start with eye drops, of which there are several types to reduce eye pressure. In more advanced cases, laser surgery or drainage devices implanted surgically in the eye are also done. There are several different types of glaucoma, with primary open angle glaucoma being the most common. In this type, the part of the eye where fluid drains is open, and eye pressure may be in a normal range, but the optic nerve is still sustaining damage. Glaucoma is a slowly progressive disease with no symptoms in the early stages. The disease is very far advanced before patients notice that their vision has changed, and the vision loss is irreversible. Narrow angle glaucoma develops when the drainage of the eye is too slow or blocked, causing very high pressures. Pseudoexfoliation glaucoma is a type that is seen mainly in patients of Scandinavian descent. Deposits of a flaky material build up inside the eye and clog drainage. These patients also require special attention during cataract surgeries. Other types of glaucoma also exist, and it can also develop after eye trauma. Routine eye exams are important to monitor for the development of glaucoma, especially if you have a family history of the disease.